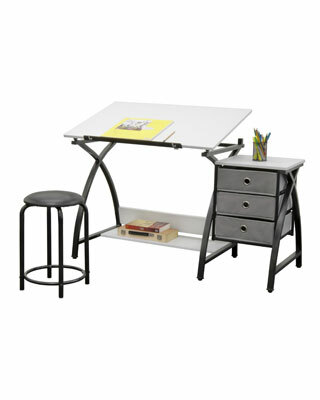 The Comet Center with Stool provides a comfortable workspace and keeps your supplies easily accessible. The tabletop is adjustable up to 40 degrees and includes a 24" pencil ledge that slides up and locks into place when needed. The set also features three attached 12.75" x 12.75" storage drawers and a padded stool.